I have so much more research to work on. Swayze in Hunterdon County, New Jersey. if he had any siblings. married his son David to Catherine Walter. county, Ohio at the age of 75. Investigate various sources for David’s birthdate. Investigate Amos & Ida Swayze for additional children. Further document David’s Military Service. Follow David’s move to Ohio better. 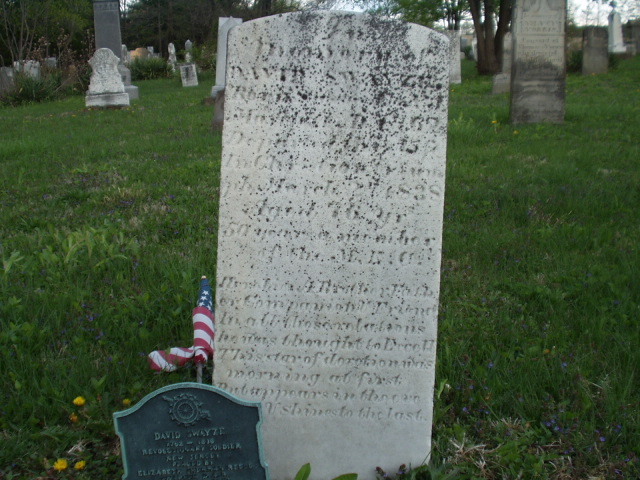 Find/acquire a better image of David Swayze’s marker where the writing is legible. Ohio, County Marriages, 1789-1994 (vi FamilySearch.org) – FHL microfilm 295268. Ohio, Deaths and Burials, 1854-1997, (via FamilySearch.org) – David Swayze, 1838. Sons of the American Revolution – Volume: 150; SAR Memb. # 22943. Sons of the American Revolution – Volume: 302; SAR Memb. # 60216.